What forms do you need to be aware of as a new agent? Are you responsible for the purchase contract and other closing documentation? What disclosure forms do you need to present to clients? This may seem like an intimidating subject to new real estate agents in NYC; however, you will learn that there is much less documentation that a real estate salesperson needs to worry about in New York City versus the rest of the country. This is because having separate legal representation for both the seller and buyer is customary and necessary in sales transactions in NYC. Once the agents have come to an agreement in price and general terms an offer is accepted, a transaction summary (i.e. Deal Sheet) is sent out to loop the lawyers and brokers in from both sides. At this point, the lawyers generally take over during what is called contract diligence and even more so after a contract has been signed during the closing process. In other states where purchase contracts are standardized, there is often no need for real estate attorneys and the agents do help their clients with closing documentation. However, the purchase contracts in New York City are much longer, customized and negotiable. Therefore a lawyer is necessary for your client to review, explain and negotiate the purchase contract on behalf of your client. Break into real estate sales with high commission splits and buyer and seller leads! How many times have you been told by ordinary brokerages that you must serve in rentals for years before you can take a shot at sales? How are you supposed to start in sales after spending years in the trenches? That’s insanity! So what forms are you responsible for as a salesperson? You should explain to the customer that this is simply a disclosure form that you are required to present which explains whom you represent. It is not a binding contract of any sort. Furthermore, they are allowed to refuse to sign it, but if they do so you must send management an email to record the fact that they refused. You can hand out disclosure forms either in person or more simply through e-signature software such as HelloSign. You should have already created a complimentary HelloSign account with your corporate email address. Who needs to sign listing agreements? Listing agreements are signed between the owner of the property and the Principal Broker of the firm or the Managing Broker responsible for your office. For Mont Sky Exclusives, the listing agreement will typically be sent out by management for e-signature. Should you be in a position to pitch sell side services to owners you’ve sourced, please contact us for a copy of our standard Exclusive Right to Sell Listing Agreement. You should send it around to everyone for e-signature via HelloSign. 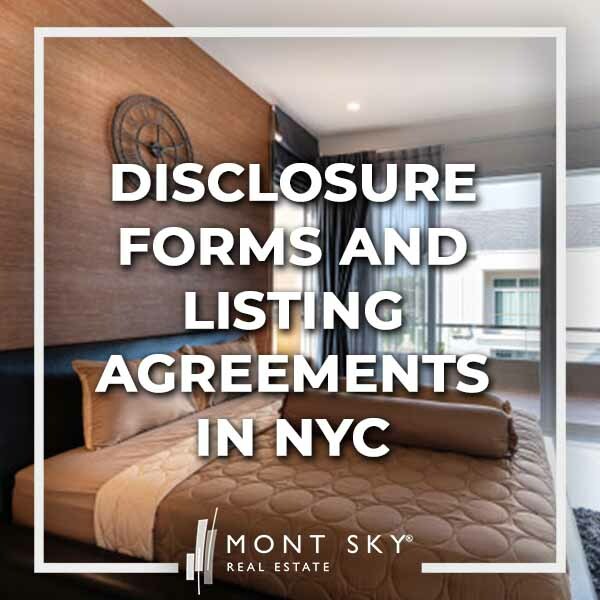 At Mont Sky, we always present agency disclosure forms to customers at first contact as a matter of principle. Customers always have a right to know whose interest we represent. Are there any agreements for buyers? No. Buyers are “free agents” when it comes to sales. It is extremely rare for a buyer to sign an exclusivity agreement of any sort. This means they are free to work with another agent, or even multiple agents at any time. Only once you have submitted an offer on behalf of a client is your position more secure. At that point it becomes harder for the buyer to switch representation as the new buyer’s agent will have a tough time proving that they were the “procuring cause” of the sale. Therefore, as a new real estate agent in NYC, you don’t have to worry having buyers sign any agreements! Note: In rare and unique instances exclusive buyer agency agreements are signed. You might see this when an agent is searching on behalf of an international buyer who is very dependent on his or her buyer’s agent who is on the ground in NYC. Are there any agreements for prospective tenants and rental leads? In addition to the NY State Disclosure Form for Landlord and Tenant referenced above, you should present the prospective tenant with a rental showing agreement, especially if you are showing apartments that are listed as CYOF (Collect Your Own Fee) or landlord buildings that are publicly advertised as no fee. This will be for your own protection in case a prospective tenant decides to try to circumvent you and go directly to the landlord after you’ve shown him or her the property.